Kyros Law represented over 100 clients in $650 million Pradaxa Pharmaceutical Liability Case. Kyros Law co-counseled with Lead Law Firm in MDL, Levin Papantonio Thomas Mitchell Rafferty & Proctor PA.
Kyros Law Client Samuel Babalola Appeals to US Supreme Court Denial of Award Under False Claims Act in $43 Million Dollar Medicare Fraud Case. Kyros Law represents hundreds of former NFL players in over $750 million lawsuit stemming from concussions suffered by players. Kyros Law with Grant & Eisenhofer P.A. Represents Greek Citizens who lost Hundreds of Millions of Dollars in Cyprus. Kyros Law specializes in a wide range of complex litigation, corporate governance matters, and mass torts, including the representation of whistleblowers, shareholders and consumers in securities fraud, false claims act and class actions. Our lawyers have been responsible for recovering hundreds of millions of dollars for our clients throughout the United States, Africa, Asia and Europe. SEC and FCPA, Claims for retaliation under Sarbanes-Oxley Act. Federal and Securities shareholder class and derivative actions, FINRA Arbitration. Medicare Fraud, Defense Contractor Fraud, and others under the False Claims Act. Consumer Class Actions, Antitrust Reporting and Enforcement actions, Mass Torts. Kyros Law files second WWF/WWE Concussion Lawsuit on behalf of former wrestlers, Evan Singleton & Vito LoGrasso. Visit our WWF/WWE Concussion Lawsuit News Website for more information. Kyros Law represents 9/11 WTC cancer victims: 9/11 WTC Victims Compensation Claims. WWE Concussion Lawsuit Basics by Kyros Law – Kyros represents more than 50 professional wrestlers including Jimmy Snuka, King Kong Bundy, Paul Orndorff, Joe Laurinaitis as well as among the first wrestlers diagnosed with CTE by Dr. Bennett Omalu. If you are a retired WWE wrestler, visit the WWF/WWE Concussion Lawsuit Center Website for more information. Kyros Law represents whistleblower in Medicare Fraud case that settles for $25 million. NFL Lawsuit- Kyros Law is representing over 500 NFL players for concussion related issues. Visit our NFL Lawsuit Center website for more information. Kyros Law & Grant Eisenhofer File Claims Against Republic of Cyprus on behalf of non-Cypriot depositors in the Cyprus Popular Bank (commonly known as Laiki Bank) or the Bank of Cyprus. If you have invested money in Cyprus Popular Bank, please visit our Cyprus Banking Lawsuit website. Kyros Law specializes in a wide range of complex litigation, mass torts, and corporate governance matters, including the representation of whistleblowers, shareholders and consumers in securities fraud, false claims act and class actions. Our lawyers have been responsible for recovering hundreds of millions of dollars for our clients throughout the United States, Africa, Asia and Europe. SEC Whistleblower and retaliation claims under the consumer fraud provisions of the Dodd Frank Wall Street Reform and Consumer Protection Act. Whistleblower claims brought pursuant to the False Claims Act (FCA). Foreign Corrupt Practices Act (FCPA) Reporting and Bounty collection. Federal and Securities class and derivative actions. Whistleblower actions under the bounty provisions of Section 21F of the Securities Exchange Act. Claims for retaliation under Section 806 of the Sarbanes-Oxley Act of 2002. Class Action claims arising under any state or federal common law or statutory law for the protection of consumers. Antitrust Reporting and Enforcement actions. Kyros Law is co-counsel with many of the premier law firms throughout the country on these matters. 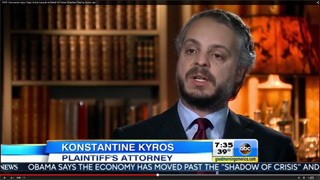 Kyros Law featured on Good Morning America segment discussing the WWE concussion case recently filed by the firm. Case development including generating clients, case identification, research, document collection, monitoring filings & developing new theories of liability. Tracking Emerging fields of practice in the SEC, Medicare, Insurance, pharmaceutical, ERISA fields. Consultation on latest client/case development strategies: press releases, web, TV, social media, referral networks. Wide range of contacts in all sectors of legal, financial, pharmaceutical industries throughout the world. Proven Success. Hundreds of millions of dollars recovered in settlements for our clients. Contact us about new matters. We employ aggressive, creative approaches to deliver justice to all of our clients. Call 1-800-934-2921. 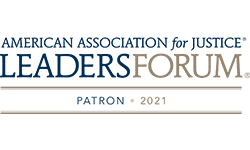 Kyros Law is a proud member of the American Association of Justice Leaders Forum.